What's With the STAR WARS Nerdgasm? Many of my friends, even those close to me, confess from time to time that they find it odd I get so geeky about Star Wars. I never fail to be surprised by this question because: a) duh. It's STAR WARS! and, b) do I come across as some sort of high brow intellectual or something? The latter concept makes chuckle because it has always been clear to me that I am a nerd at heart. I get unaccountably excited by odd, random things, I spend so much time in my own head that I usually walk around with demented hair and stains on my clothes, and there is nothing that bores me more than being stranded in the middle of an intellectual circle-jerk discussion about cutting edge literary fiction or cryptic films. Anyway, suffice to say my love for Star Wars goes very, very deep. 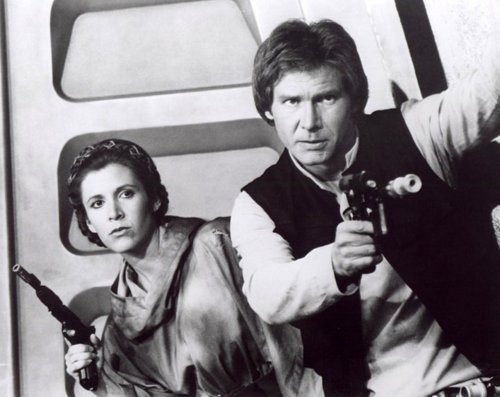 My first encounter with Han, Leia, and Luke was one of the most profound spiritual awakenings of my life. It was 1977. I was five years old. My Dad, who was never one for going to the movies, decreed that he was going to take my older sister Suzanne and me to see this new film that everyone was raving about. It was called "Star Something". I was immediately suspicious. "Is it a cartoon?" I demanded. "No. It's a real grown-up movie," he said, as if this was a good thing. No thanks. Anything that wasn't a cartoon held zero interest for me. Besides, by the wise old age of five I’d already figured out that grown-ups found boring things riveting, such as conversations about mortgages and the optimal shade for shag carpeting. How exactly my father managed to drag me to the Odeon movie theater in downtown Victoria is now lost in the mists of time, but I do remember feeling put-upon as I flipped down my movie seat. My Dad reached in his coat pockets and pulled out three full size Mars bars, one for each of us. "Isn't it funny?" he said. "We're going to watch a movie about space and and we're eating MARS bars!" I knew the chocolate bars were a peace offering, but I was still dreading the movie. Also, it was about space. I hated watching the documentaries about space on PBS with my parents. They never failed to leave me fretful about a meteor falling out of the sky and squashing me. Space. No cartoons. A grown-up movie? I chomped resentfully on my galactic-sized Mars bar. The lights dimmed and the screen filled with a weird sort of writing that slid backwards instead of side to side the way writing was supposed to. Besides, I couldn't read yet. What if the whole movie was just words on a screen? That would be the kind of useless thing that grown-ups would enjoy, I thought bitterly to myself. Then the writing disappeared and the screen filled with a battle on a star ship, and R2-D2, and C3-PO, and Princess Leia. Hey...was that beautiful lady really talking back to those evil men dressed in black? Was that a lazer gun she was shooting? Me as I knew myself up until that point vanished like the planet of Alderaan. I wasn't just watching this movie, I was living it. I sat motionless, plastered against the back of my seat with the centrifugal force of the story, the half-eaten Mars bar dropped, forgotten, on my lap. I had not know this was possible. I had not known that through a story I could actually live a different life for a while - a life that was more vivid and more real than my own. By the time the Millennium Falcon swooped in with Han at the helm to shoot away Darth Vadar so Luke could take his bull's eye aim at the Death Star exhaust vent, I thought my heart was going to explode. What was this magic that could transport me to another time and place more effectively than a time machine and a tele-transporter all wrapped up into one? When the medal award ceremony was over and the movie's credits rolled I stayed glued to my chair, as did Suzanne and my Dad. Finally the lights came back on. My Dad turned to me. "So? What did you think?" I shook my head, mute. No words. There were no words. He looked down at my lap. "You didn't finish your Mars bar." I hadn't. I actually threw it in the garbage can on our way out of the theater as I was still too deep in my walking Star Wars daydream to do anything as pedestrian as eating. Up until then I hadn't known such a magic existed, but I knew it was something I wanted and, more than that, needed in my life. It wasn't until I was older that I learned the name for The Force that inspires me just as much at age forty-six as it did when I was a five year old sitting in a darkened movie theatre. That Force is storytelling. Also, I bought myself a laser-gun. Join the vibrant community of nerds, readers, story-lovers, Francophiles and foodies. You can unsubscribe at any time . Author of the Bestselling “GRAPE” series. Hopeless romantic and Citroen, croissant, Burgundy-loving mother of three daughters and wife to French husband. Sign up to receive exclusive news on Laura's books, Burgundy and updates. and win a free stay in Burgundy!